When Herb Higginbottom’s first wife got sick he needed to stay home and look after her. He had been collecting old tools for 50 years and was inspired to transform his house into a museum. His extensive collection of tools, engines, household items and equipment date back to the early 1900’s and he even has some of the original magazine ads to prove it. The collection is spread out across his front yard, back yard and garage and his collection of household items fills two rooms in his house. The man’s house is the museum. But with very little money to advertise, Herb took the advice of his second wife who told him that if he wanted to draw a crowd, he needed to build something big…but what? And then it came to him, he would build the world’s largest manual lawnmower. It took Herb a year and a half to custom build the over 4000 pound work of art. He even had to build his own set of rollers to roll the steel. But that wasn’t the first time Herb customized his own equipment. 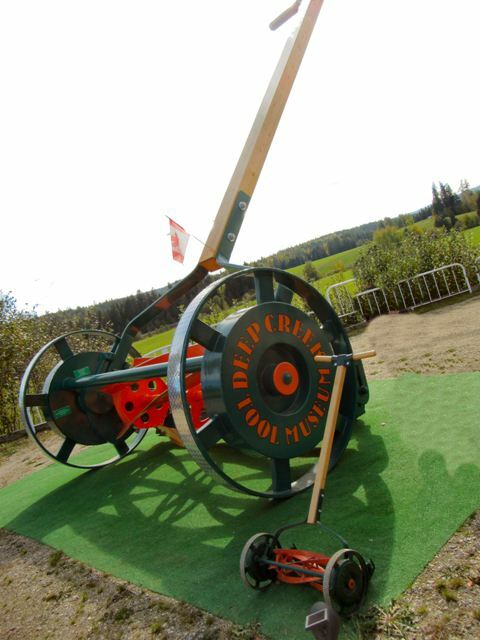 On the tour, be sure to ask Herb to show you his homemade woodcutting machine as well as his homemade bulldozer because what differentiates this museum from any other is Herb himself. His enthusiasm for antique tools and equipment is contagious. Not only does he give you the history of the equipment he also starts up many of the pieces and operates them. How cool is that? So if you are interested in learning about BC history through the evolution of tools and equipment, the Deep Creek Tool Museum is the place to visit. The Deep Creek Tool Museum is open year round and features personalized tours, restorations, and sales. It is located at 91 Deep Creek Road in Enderby. Call 250-832-2506 for hours or more information. Hi Teresa, Thank you so much for the article about our tool museum in the Kamloops paper in March. We started getting phone calls and have had a tour ,with more coming in better weather. A friend sent us the article.